Our Marilyn impersonator-lookalike is a consummate actress with many film and tv credits. She’s done tv commercials for Channel, McDonald’s, Amstel Beer, Visa and many other noted companies. 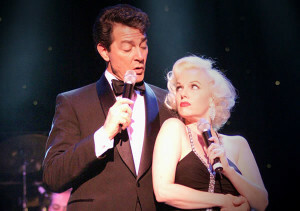 On stage, she was the original Marilyn for Legends in Concert in Las Vegas. She’s appeared as Marilyn at events given by Ford, IBM, Panasonic, AT&T, G.E. and many others and she’s also appeared at most of the big trade shows. She’s received The Cloney Award for Most Outstanding Impersonation as well as The Reel Award for “Best Actress”. She’s been featured in LIFE Magazine, Las Vegas Weekly and many other magazines. She’s available anywhere in the U.S., Canada and Asia.